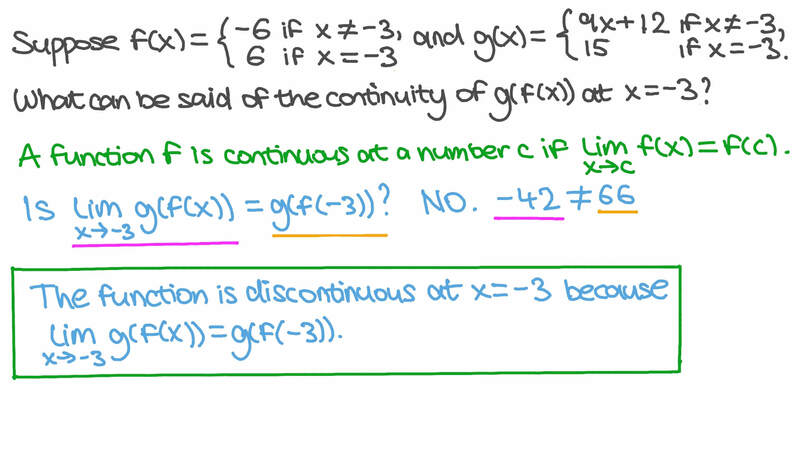 In this lesson, we will learn how to determine the continuity of a composite function based on f(x) and g(x). Suppose and What can be said of the continuity of 𝑔 ( 𝑓 ( 𝑥 ) ) at 𝑥 = − 3 ? AThe function is discontinuous at 𝑥 = − 3 because l i m 𝑥 → − 3 𝑔 ( 𝑓 ( 𝑥 ) ) ≠ 𝑔 ( 𝑓 ( − 3 ) ) . BThe function is continuous at 𝑥 = − 3 . CThe function is discontinuous at 𝑥 = − 3 because 𝑔 ( 𝑓 ( − 3 ) ) is undefined. DThe function is discontinuous at 𝑥 = − 3 because l i m 𝑥 → − 3 𝑔 ( 𝑓 ( 𝑥 ) ) does not exist.